How many hours have you spent so far with your calls on your current mobile phone? Photo taken on 2019.02.04, 14:16 CET. Photo taken with Huawei Ascend Y300. I currently have a Nokia C2-01 since 2012. There is a Log menu, and there is a "Call duration" statistics in it. Last call: 00:04:06 (0 hours, 4 minutes, 6 seconds). Received calls: 102:16:35 (102 hours, 16 minutes, 35 seconds). Dialled calls: 26:27:21 (26 hours, 27 minutes, 21 seconds). All calls: 128:43:56 (128 hours, 43 minutes, 56 seconds). 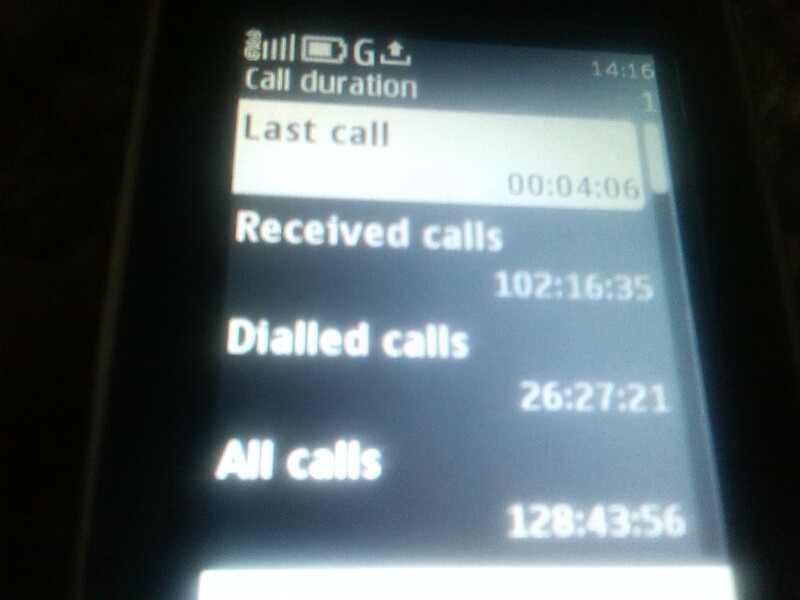 So, I spent 128 hours with my calls so far on my current mobile phone. What about you? How many hours have you spent so far with your calls on your current mobile phone? 1 hour or more, but less than 10 hours. 10 hours or more, but less than 25 hours. 25 hours or more, but less than 50 hours. 50 hours or more, but less than 75 hours. 75 hours or more, but less than 100 hours. 100 hours or more, but less than 200 hours. My current mobile phone is not showing this data. I currently don't have a mobile phone.